Please keep in mind that if you order items with different shipping times, the order will be shipped out at the later date. 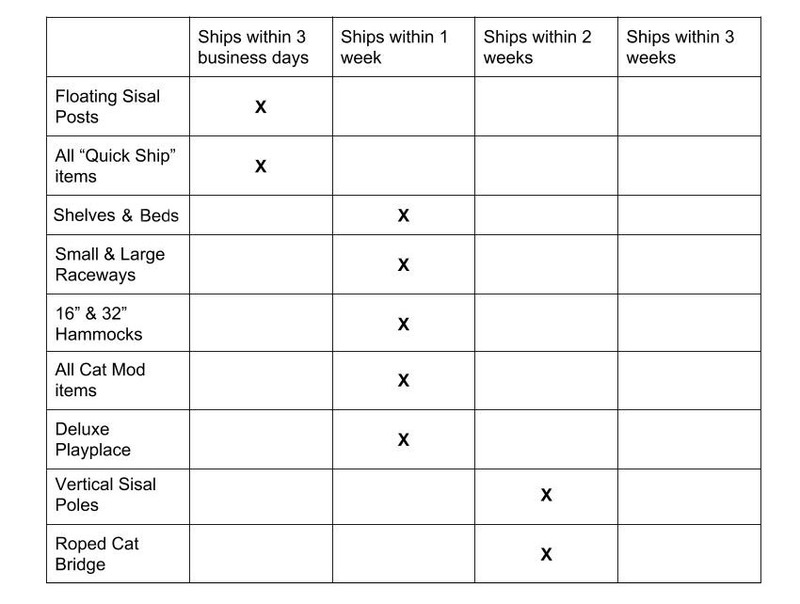 If you need your items shipped out at different times, you must pay separate shipping charges. To do this, just place two (or more) separate orders. If I provide a photo of the front door with big window above it and the measurements could you help come up with a plan for my 11 year old cats Bonnie and Clyde. They had front claws removed as kittens so it would affect the climbing. They are good at jumping. But I want them to be able to enjoy it as they age. How heavy of cat do you figure these support? Hey Patti, As long as the furniture is mounted properly, all of it has been weight tested to hold 85lbs at each plank or shelf and 65lbs at each hammock section. Most of the furniture is made for furniture spaced out at 16″ because that’s the most comon in US homes. Our Cat Mod furniture works for 16″ and 24″ wall stud spacing. Thanks! I love your ideas!! And look forward to ordering some of your items in the near future for my FOUR cats, to put in the new house we are building. One question, could you create some kind of sisal covered tube with play holes cut into it to mount vertically maybe?? My cats love to play in boxes with holes in them. Just a thought. Love your work though, good job!! Hi I live in the UK and saw your amazing creations on Erzy. We want to purchase a number of pieces but the shipping cost is very high! Over £250! Would it possibly be cheaper directly from you if shipped in one lot? Hi Caroline. I understand that international shipping costs can be pretty high. We do have inventory on our UK Amazon store, however! This could be a more cost-effective option for you. Hello do you ship to Italy (Europe)? I coundn’t find the international countries shipping list anywhere! Please let me know. Thank you! Hi Antonella! We do ship to Italy! If you’d like to see the shipping costs, you can add the items you like to your cart and then click the cart button. From there scroll down to where there is a Calculate Shipping button and input your address. You will then see the shipping rate populate. I’m looking for a design that will allow my 3 kitties to be able to go from living room – around the corner into the hallway – into the bedroom – at a height close to the ceiling. The living room door has two shutter doors (not moveable re: apartment), and there are frames/trim around both doors. I really need to get them off of the floor because fights are a plenty down there. I’d also like to be able to have all 4 of us in my room at night and each kitty feel like they have mommy time and have their own space, so I’m guessing some kind of wall configuration would be great. I currently have a 72″ multi level cat tower in there, and they like to sleep on the desk in front of the window, and in my bed but they all want to be in there but not sharing with each other. Sorry for the super long post! Hey Melissa. If you send over some photos of your space along with wall measurements, we will be able to give some guidance and item suggestions. Please email those to our customer service specialist, Tabitha, at questions@catastrophicreations.com. I love your creations, and think our 4 cats will, too. We’re only about an hour away…is there a place we could visit and check out a set up in person? Hi I’m interested in possibly buying some stuff off your site. My question is do you have any reviews from customers that have bought your products? We do! Most customers will post their reviews on our Facebook page and we also have over 2,000 reviews on Etsy. Today I bought the Cat Mod – Fort Deluxe, but I have not received the confirmation mail. Is this normal? Hi Aliénor. I’ve sent another confirmation to the email provided. We do have your order and it is due to ship on 3/28/19. Once shipped, you will receive an email with tracking information enclosed.